In a staunch and insular Orthodox Jewish community, a drifter arrives, Ezri looking for work and accommodation. Aaron, a married father who has re-opened his father’s Kosher butcher shop in Jerusalem offers Ezri a place to work and to sleep upstairs from the business. Ezri is young, handsome and seems out of place in an essentially conservative society, harbouring a talent to draw and a deeper homosexual feeling towards Aaron. Initially their relationship is purely platonic, but its very difficult to separate feelings when they work, pray and basically spend all their time together. The sexual tension is rife, especially in a neighbourhood which has already demonized another man for having an affair with a young woman, contracted to be married to someone else. Ezri invites Aaron to step out of his comfort zone and travel out of Jerusalem to some sacred waters for spiritual cleansing. Soon their intimacy turns to passion in the backrooms of the Kosher butchery, and Aaron enters a forbidden relationship with Ezri in a tightly-knit neighbourhood which is already threatening to boycott his business for being unorthodox. Elders from the synagogue advise Aaron to let Ezri go as his reputation suffers, for the sake of the moral fibre of a community that cannot suffer from the foolish love between men. To have a window into another belief system so different to one’s own is a privilege enough, and this Israeli film is remarkable that it was ever made in the first place, with the financial backing of the Israel Film Fund and is fascinating not just at the perceptive look at an orthodox community, the strict social customs and the religious traditions which bind it, but also at the taboos which also threaten to dissolve the very strands that hold that community together. Marriage, family and children are sacred and non-conformity is frowned upon as a deviancy left to drifters. 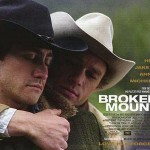 Eyes Wide Open is a riveting film, held together by the brooding and simmering performances of Ran Danker, who shines as the seductive and outgoing Ezri and Zohar Strauss as the morally conflicted and claustrophobic Aaron both entwined in a relationship as doomed as that portrayed by the Wyoming cowboys Jack Twist and Ennis del Mar. 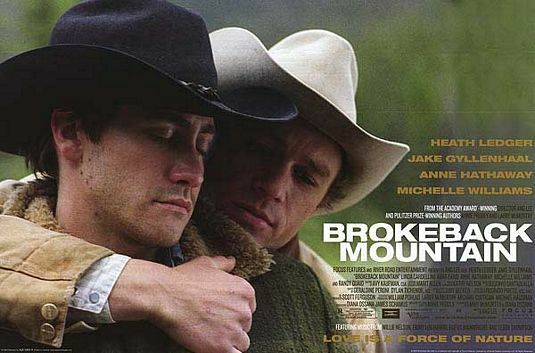 Both Eyes Wide Open and Brokeback Mountain depict forbidden relationships between men that are at supreme odds with the environment that they are forced to inhabit but cannot relinquish. As for Ezri, like Jack Twist, both would be more comfortable in cities like Paris, Toronto and Rio de Janeiro, but have to accept the consequences of taking risks for the sake of desire in a hostile world.